When I am walking through the Celery Bog I never know what to expect. This was a case of that. I saw a little trail heading to the water so I started walking it. Suddenly a ton of Carolina Chickadees started moving around. 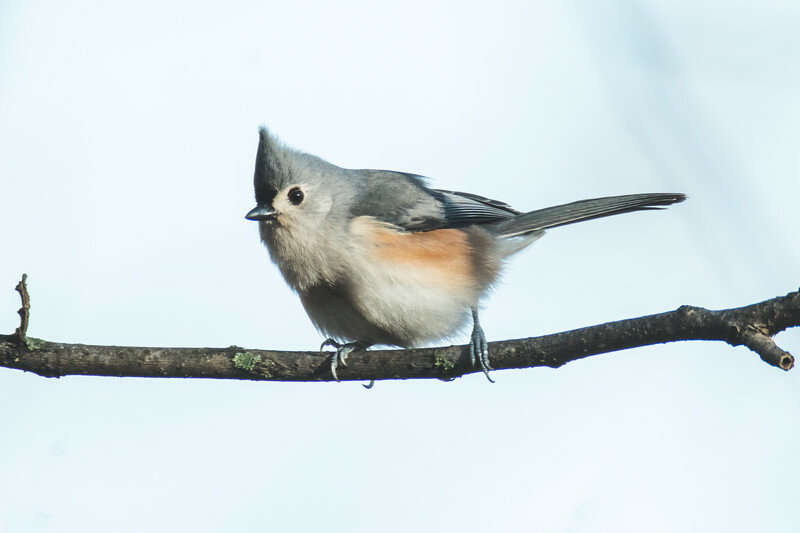 They never were enough in the open to make a photo, but this Tufted Titmouse decided to perch above it all to watch me. After allowing a couple of photos it flew away. It was a fun little side trip on my first walk in the bog of the new year. On this first trip to the bog I had some good light. Even in the woods I was able to shoot at 1/800th of a second at f/8. You really can’t ask for much more than this. Yesterday I was around 1/125th to 1/250th of a second because of the cloud cover. You really have to ask the birds to stay still at that shutter speed. They don’t always like to cooperate so it makes the photos you get that much better. Using the 2x tele on an f/4 lens means you are at f/8 all of the time so light becomes very important. I could take the tele off the lens, but the birds don’t like me to get too close. It is a strange dilemma.